Daring Delvers - Adventure! Excitement! GLORY! Ponyville Daring Delvers - Adventure! Excitement! GLORY! Dash felt that thrill in her bones that only came from the anticipation of true adventure! Of excitement! Of glory, and a quest to be won! She zoomed through the air with a bright light in her eyes, a song in her heart, and a dedication to NOT BE TOO LATE! Her friends needed her! Danger was ahoof! Doors were so boring, and besides, she caught a glimpse of tri-color purple mane through that open window. With a dramatic flourish, she burst in through the window and struck a pose. "The game's ahoof!" she cried at full volume and bravado without actively shouting, her wings flared and her head back defiantly. "You won't defeat us!" As Twilight's fur, feathers, and hooves all started to settle back down from their shock and surprise, Dash went on in a more sedate manner, "I brought my miniatures, I got some dice, and I brought some Rainbow Smoothies from Cloudsdale. Oh, and your triple order of hay fries, of course! Got here fast enough that the Smoothies won't have melted yet! You can keep 'em cold long enough for everypony to get here, right? Who all is coming?" She set her saddlebags down - what room was this anyway? This palace had so many rooms, and they were all so fancy! "Ohmygosh Ohmygosh Ohmygosh! I can't believe we're finally playing Daring Delvers! I have my character all made and junk! Is Daring Do actually part of the game? She's gotta be, cause she's part of my character's backstory. It's a masterpiece! I'm not too early, am I?" A lot had happened recently, good, bad and otherwise. Rarity's life seemed to be on some kind of bizarre carnival ride, going up and down and all over the place. The unusual castle where she found herself now was clearer evidence to that than just about anything else. To think that something like it would just pop up suddenly from out of nowhere within Ponyville was just insane, and yet here it was, responding to the strange box near the Tree of Harmony that had been opened only after all six of them had proven themselves to be worthy of their elements. Through it all, there were some things that never changed, however, and chief among them was friendship. That they could gather in this big castle and enjoy moments together, just playing silly games was proof of that. Rarity had quietly become something of a Daring Do fan. She wasn't quite as fervent as Rainbow or Twilight, but she did get the appeal of it. Who didn't love a little adventure and excitement? Meeting the real Daring Do, of course, certainly helped her appreciate it, as did the frequent adventures in Rarity's own life, as well as her friends' enthusiasm. She had even, for a recent trip deep into the Soggalong Swamp, found her own little vest and pith helmet. It had been somewhat difficult to get the swamp aromas out of them, but she was wearing them presently as a sort of costume for the event. The fashionista didn't know very much at all about games like Daring Delvers, but she was enthusiastic to learn and up for anything if it was a chance to relax and have some fun with some of her very best friends. When Rainbow finally made her entrance, Rarity turned toward her and smiled her way. "Good afternoon, Rainbow darling!" she declared excitedly at the sight of the rainbow-maned pegasus. "I'd love one of those smoothies, Cloudsdale smoothies are always so divine..." she said with a smile. She giggled a little at all of the pegasus' great excitement. "Oh, my, is this game really so much fun? You're getting me excited for it," she said. Carrot Fields was pretty excited about getting invited by Rainbow Dash to participate in the Daring Delevers game with her and close friends. It made sense though, he was a fan-colt of Daring Do and each of the times he really spent any time with the rainbow maned pegasus involved around their mutual love for the stories of Equestria's favorite pony of adventure! Heck, he even had his workshop set up to paint miniatures of the characters from the various Daring Do novels. Of course getting to play the Delevers game was actually secondary to who he gets to spend time playing it with. What did make him nervous, well more nervous than spending the day with several cute mares, especially the one closest to him, was spending it at the new castle in Ponyville. Like pretty much every other pony in the Ponyville area, Carrot wasn't yet used to the crystalline tree shaped castle that now dominated the local scenery, but he figured he would get comfortable seeing it over time. Going inside was another matter; it was the home of royalty after all, a castle, and why was he visiting? Not because of a royal summons or business, but to hang out with friends playing a game, thanks to the fact one of the players was the Princess of Friendship herself. It just felt strangely inappropriate, a thought brought home when Carrot pulled out a parchment to show the two royal guards standing outside at the entrance that he was invited, signed by Twilight. They briefly read the paper and without a word, stood aside as the door opened and he walked inside the beautifully decorated hall. It didn't take long to find the ordinary looking room in the castle where the game was going to be played; it helped of course that Dash's enthusiastic voice easily carried through the narrow hallways of the palace. Carrot walked in with a broad, abet shy smile as he saw Dash, her friend Rarity, whom he met once before, and Twilight. He knew he would catch some playful flak from Dash for this but he felt it was necessary to briefly bow towards Twilight before anything else, "Guid morn yer highness." There was no need for anymore formality than that, as he learned from his last encounter wight he lavender alicorn, besides this wasn't the throne room, but some back room obviously designed for simple relaxation. besides if he got all formal again, Dash would never allow him to live it down. As the ruddy maned stallion sat his saddle bags down he gave a wave towards Dash and Rarity, unsure as to be any more physically friendly than that, as much as he may want to, "Guid day guys, Ah brooght everythin' Ah hink Ah need, pencils, pepper, mah first printings ay th' Darin' Delevers rule book, player hoofbook, an' e'en th' monster guide!" He smiled broadly, blushing a little, as he was proud of his little collection. "Och, e'en miniatures!" He plopped down a few various peagsai miniatures to use, because hey he can be one in a game, right? "oh, almost forgot, also brooght mah sister's carrot cake muffins, freshly baked! sae, anypony else comin'?" Twilight was a mare of ten thousand concerns in ten thousand locations every ten thousand nanoseconds. Her schedule was packed full of meetings and visits with ponies(and non-ponies) far and wide compounded by the endless busy work of a Triarchian monarchy bureaucratic mess generations overdue for an efficiency overhaul. She felt every ripple sent through Equestria small and great and the tidal wave of global events impacted her first and demanded her attention the greatest of all. Every tribal spat in Unyasi or trade dispute between Maretonia and Saddle Arabia somehow ended up on lap and heer schedule was put to the flame. Time and time again had her plans for free time with her friends been scorched and burned in such a manner and she had a feeling that it would never quite end. There were many things she loved about her job. Time willing, checking the gears that kept Equestria running or seeing the great leaders if the world trade wit and plot as easily as smiles and agreements in the flesh was worth the price of responsibility. But time hardly ever willed itself positively. So instead of allowing time to dictate her fate, she redoubled her efforts to make fate bed to her will through the audacity of her work. She got aggressive, forcing meetings with belligerent parties who usually just parried. She forced agreements even if it took locking doors in her castle to prevent the parties from leaving. Sure she ended with a few sour looks from the diplomats but the deals were fair and received well in many quarters. Triplicate records became duplicate records and departments that were illogical in their functions shuttered in favor of those that made sense. She worked longer and harder than she had ever worked and her efforts started to show results. First as a trickle before the stream before the raging river, the cascading waters of time and sustainable friendship relieving her of the stench of loneliness and grinding nature of her work. Her time was free for the first time in a long time, and it had happened just IN time- because today was now a free day, and today was the day she had been working towards these many weeks. Finally, she would see the majority of her friends. Sure, even during her hectic schedule she still saw them and got to chat and keep abreast of their lives, but she never really felt as though she got to do things with them anymore. All work all day made for a weak play. Finally she had them free and pencilled in and nothing could stop her. She had even sent all of her attendants home- and if they lived in the castle she ordered them out- so that only the barest amount of staff were on hoof to try and deliver any urgent news to her. Emergency schmergencies: She had a game of Daring Delvers to play! First to arrive had been Rarity but quick behind her was Rainbow Dash, who had done as requested- she came back with smoothies and fries, the agent to cure her Alicorn appetite for the hour. Or less. It came and it went which was the most infuriating thing of all. If it was consistent she could plan on it. Her entrance through the window caused Twilight to rear up for a second, but at this stage in their friendship Twilight had become immune to the charms of suddenly Rainbow Dash. "Thank you Rainbow Dash!" Twilight beamed as she levitated her share of the loot over to her side of the large stone table. Usually this room was reserved for semi-private meetings just outside of the throne room. While real business was discussed on the upper floors, this one was where press and invited guests could sit in and listen as diplomats related their public talking points at a table across one another. Likewise, Twilight had made it small so as not to make it a venue glamorous for somepony to waste time at. It would fit today's purpose though. Enough room for all five participants and then some but not so much it got uncomfortable. "The smoothies will be fine. Carrot Fields should be here any minute and I know Fluttershy is on her way. Between those two and us three, that would make five players. As for Daring Do herself- we are playing a custom game that is putting several sets together. She might make an appearance or she might not. You'll just have to Dare to find out!" Twilight said with a glint in her eye, always enjoying those old back of the book end lines from the Young Daring Do series. Sure it was cheesy, but fun things sometimes were. Hopefully Rarity would agree that this game was fun. It felt odd to see her involved in such things but that only added to the rich tapestry of her bulbous personality. "The game is really very fun, Rarity. This game requires a lot of creativity and you are the most creativity pony I know," Twilight assured Rarity, and probably herself, hoping all the same that the game would be to her liking. Then Carrot entered, carrying the royal parchment she had given him. In truth she had wanted to dismiss even those guards, but the Captain had certain orders that even a Princess couldn't dismiss without cause. In any case, Carrot was a really sweet stallion and if her love-radar was functioning, him and Rainbow Dash were a couple. Twilight had ran the scenarios over in her head a thousand times trying to come up with a different answer, but she couldn't. They wanted one another. They needed one another. They wou;d have one another eventually when their emotional caution was buried under the torrent of passionate emotions that Carrot kept in check with his shy demeanor and rainbow deflected towards bravado and daring. Maybe they would kiss tonight. Probably not. Either way, the nerd in Twilight had already written the story. He bowed and she sighed, smiling all the while as she beckoned him to rise. "Glad you could make it Carrot! We're just waiting on Fluttershy...and may I have a piece of that cake when you're done getting comfortable?" Twilight asked before she started levitating her materials around. "Okay. When Fluttershy gets here we will go over the rules and how to play. It is a relatively simple game- miniatures on a gameplayable set. Terrain, event cards, player cards, enemy traps and monsters and player abilities and statistics all come into play. Rarity, have you ever played anything like this before?" One of the things she still was not used to was the guards at the doors. They of course had orders to allow her and any of her friends to pass, but it still made her feel uncomfortable passing between them as she entered. She kept her head down until she was inside, then started making her way upstairs. This was going to be an... unusual visit for Fluttershy. Rainbow Dash had talked her into participating in this game, but she had no idea what to expect. Fluttershy had read a couple of the Daring Do books, but she was not a fan like Twilight and Rainbow were. Fluttershy much preferred romance novels, though she tried to keep that a secret from most ponies. The yellow pegasus pushed open the door to the meeting room and saw that she was the last to arrive. "Oh! I'm sorry!" she said, "I hope I'm not late!" She saw Rainbow hovering in the room near Twlight, the blue pegasus looking like she was about to burst from excitement. Fluttershy was comforted by the presence of Rarity, who had also never played this before. At least she wouldn't be the only one just learning. Fluttershy's gaze then found the the fifth pony here, a grey and red stallion that she didn't recognize. She knew that a pony named Carrot Fields was supposed to be here, and that he was friends with Rainbow, but Fluttershy had never actually met him. Ducking behind her hair, the pegasus stuttered out, "I, um, I mean... hello..."
Rainbow Dash bounced happily to see so many of her friends there, ready for action and adventure. "I dunno, Rare! I haven't really played it yet, I've just been reading the books. I can't wait, though! I've got this whole story written!" She nudged one of her saddlebags with her hoof, and carried the rainbow smoothies around, dropping one off before Rarity. "Glad you could make it!" She continued on, putting one smoothie at each spot around the table. At Carrot's bowing, she snorted and noogied his mess of red mane. "It's evenin', goob!" she laughed at him, and snagged one of the carrot cupcakes, getting a bit of white frosting on her cheeks as she pretty much swallowed it whole. "Mmmm! Yer sis makes good cupcakes!" she mumbled around her full mouth. "She hassle you much fer bein' an egghead 'bout this?" she snickered. "Mmph.." She tucked her wing around Fluttershy and pulled her closer. "This here's Fluttershy, and I think she's the only one you haven't met yet. I've been friends with her since we were both foals. Fluttershy, don't worry, he's a goof but he's cool." She straightened up, and casually went on, "I mean, he's all right. He has the carrot farm outside of town, next to Sweet Apple Acres. Carrot, you should totally get Fluttershy here to work at getting rid of those rabbits eating your crops. She's great at that sort of thing!" Then she grabbed Twilight. "That's cool, all mysterious and stuff, nice. I hope she does, though, cause ... can we share characters now? Cool," She didn't wait for a response as she went on. "See, I'm using Dawn Prince, from the short story Daring Do and the Runaway Groom? It was one of her earlier books of short stories and I know lots of ponies don't like him and thought he was annoying but I thought he had a lot of potential so I wrote up this backstory of what he's been up to since he found out his bride was actually a changeling and he was on that adventure with Daring Do. See, reading between the lines, I figure he and Daring Do had a romantic moment or two in there, right? And then that flood in the tunnels separated them, so he's been spending the last several years searching for her, but everywhere he flies, he's just missed her by a couple weeks, so he sees all the adventures she's been on and has had a whole lot of adventures of his own, and yeah, he loves Daring Do, but he hasn't found her so he's been leaving this trail of broken hearted mares behind him. I took a few flaws, from some of the supplemental books, but nothing too serious. Just a couple dozen. But he's pretty *awesome*! I can't wait to show you! And I have a forty page character background for you to read, too! I mean, not now, unless you want, but I can leave it with you! It's all right if I play a stallion, right?" "I dunno, Rare! I haven't really played it yet, I've just been reading the books. I can't wait, though! I've got this whole story written! Glad you could make it!" Rarity smiled gently at Dash's words. "How wonderful. From what I understand about how the game works, it does sound like it shall be a fun time. I'm pleased that the two of us will be able to experience it for the first time together!" she said, nodding. She took a sip then at the smoothie Dash left with her, enjoying the sweet mix of flavors in the rainbow colored beverage. "Mmm, these really are delightful!" she attested. "The game is really very fun, Rarity. This game requires a lot of creativity and you are the most creativity pony I know,"
The fashionista looked then at Twilight as she spoke up. She blushed a little for the compliment and giggled. "Why thank you, Twilight. How kind of you to say that," she said. "Guid day guys, Ah brooght everythin' Ah hink Ah need, pencils, pepper, mah first printings ay th' Darin' Delevers rule book, player hoofbook, an' e'en th' monster guide! Och, e'en miniatures! oh, almost forgot, also brooght mah sister's carrot cake muffins, freshly baked! sae, anypony else comin'?" The unicorn looked up when the door opened and a fourth pony appeared. She recognized him though she had only met him once before. He was a charming stallion with a thick Fet Loch brogue and had, last she had seen him, even worn a fashionable kilt. Carrot Fields was his name, and he was friends with a number of ponies in town from what Rarity understood. "It's a pleasure to see you again, Mr. Fields, darling," Rarity said with a polite smiled toward the stallion. "Why, I haven't seen you since..."
Rarity trailed off with some awkward laughter when she recalled where she had in fact first met Carrot. That had been a day she wished she could forget. It had been Apple Bloom's birthday party and though Rarity had tried only to enjoy the festivities, almost everything had exploded back in her face. She had been covered in multiple sticky messes and ended up in... compromising positions more than once. There were few days she could think of where she had been more glad to see the day come to an end. None of that was Carrot's fault though of course. She forced herself to smile again and get it together as she looked toward him..
"Well... I would adore one of those muffins, dear," she said as she calmed back down to a natural nod. "They smell absolutely scrumptious..." she added as she took in the scent of the fresh baked good. What a wonderful compliment to Rainbow Dash's delicious smoothie that would be. Rarity closed her eyes in thought at Twilight's question. "Hmmm..." she said, nothing coming to her immediately. "Well, I have played board games with Sweetie before... but no, I can't say I've played anything quite like this game. I'm sure I'll definitely have a lot to learn. I do remember what you all told me about it though, and I have already decided on my character at least!" "Oh! I'm sorry! I hope I'm not late!" The fashionable mare smiled as Fluttershy, the last pony expected arrived for the game. The yellow pegasus was a close friend of Rarity's so it was always good to have her around. "Oh, it's nothing to worry fore, Fluttershy," Rarity said in a comforting voice, hoping to see her shy friend relax. "Everyone else has only just arrived as well." "That's cool, all mysterious and stuff, nice. I hope she does, though, cause ... can we share characters now? Cool,See, I'm using Dawn Prince, from the short story Daring Do and the Runaway Groom?... But he's pretty *awesome*! I can't wait to show you! And I have a forty page character background for you to read, too! I mean, not now, unless you want, but I can leave it with you! It's all right if I play a stallion, right?" Rarity just giggled as Dash told them at length about the character she intended to play as. "Oh, Rainbow darling, I'm sure that's perfectly fine with all of us," she asserted, nodding. "I'm sure, in fact, that you'll make an exceptionally suave and charming prince!" The mare chuckled and then sighed. She had once had her sights set on the fantasy of a handsome prince, until that illusion had been irrevocably shattered for her at her first Grand Galloping Gala. She no longer thought of collapsing into some perfect specimen of urbane nobility, as she realized that that wasn't what was important to her. Nevertheless, a prince's role, she couldn't help but think, fit Dash well. Charismatic and bold, with a want for adventure, balanced by a kindness and unwavering loyalty to those she held dear--Dash's personality matched well with Rarity's idea of the perfect storybook prince. Seeming her get all giddy at the idea of romance between her prince and Daring Do just completed the picture for Rarity and made her smile a warm smile. After Dash had finished Rarity nodded. After hearing about the game, she had went right to work trying to come up with a good character for it. She had put more thought into her than she cared to admit. "Hmm, well," Rarity coughed. "I suppose if we're doing the characters first, I shall tell you about the one whom I have chosen... but before I do, I believe we need a costume change!" she said with a glee as she stood from the table. All at once she threw off her generic Daring Do inspired getup off of her and pulled some fabrics from her saddle bags, which she had placed nearby. A few flashes of unicorn magic later and Rarity stepped back toward them.dressed in a short but fine dark green hood and cape and a black scarf over a tight fitting black bodysuit. With more magic, she then undid the coif of her her mane and let her fall down in a messy wave around her face. She was convinced it was a fine costume which she had made all by hoof the night before just for the occasion. All it cried out for was a fine dagger for an accessory. "Now," Rarity started as she walked back toward them proudly. "I had considered any number of characters. I thought for a time that I'd play as one of Princess Veil's exiled sisters from Daring Do and the Secrets of the Forgotten Kingdom, or maybe even one of the Gale Wing Pirates, but instead I decided on a character I found quite intriguing: Cobra Lily, the cunning lady unicorn thief from Daring Do and The Crimson Tower. I thought the repartee between her and Daring throughout the book was delightful, and it seemed there was more to the character than it appeared, especially as it seemed implied to me in the book that she was actually the daughter of Thumos, the mad sorceror who built the titular tower and inadvertently traps Daring Do within," Rarity paused a moment, wondering if the others wouldn't be surprised she had read as much Daring Do as she had. She figured she was still probably far behind everyone there save Fluttershy in terms of knowledge of the series, but it still felt good to show her enthusiasm for her selected character, just as Dash had. "As I see it, her flippant attitude and tendency to both carelessly flirt with and find herself at odds with others, including Daring herself, is a result of her circumstances. Growing up alone, ashamed of her origins and with no one to depend on but herself, she's put up walls around her, and though she looks down on and toys with others, in truth she desperately yearns for a closeness she's never had in her life. That's why, despite all the conflict they have in the text, she ultimately decides to spare Daring from the blade trap! She may be rough around the edges, but I think, deep down at least, she wants for somepony who will be good to her, who she can trully hold close and open up to," Rarity finished speaking about her character, giving a slow nod when she was done. Carrot Fields placed the well frosted carrot cake next to the other food on the counter, it's aroma already filling the room with sweet deliciousness. He wasn't done though, he also placed some glazed carrot flavored muffins next to the cake. Purple Haze insisted on going that extra mile when she heard he was going to be at the castle, it was obvious she hoped to impress the princess with her delectable treats and Carrot knew he would have to give a detailed report on what Twilight thought when he got back. For now he contented himself on cutting a slice and trotted over to where Twilight was sitting, he placed the plate in front of her and gave a courteous bow, "Haur ye go yoor-High er Twilecht, Princess Twilecht". Despite Dash insisting that he should treat her alicorn buddy informally, it was very difficult for Carrot to not show deference, after all it was expected of and drilled into him when he served in the R.E.A. By the time Carrot sat back down by the rainbow maned pegasus, the last pony in the game had shown up, fretting about being late. This had to be Fluttershy based on the description Dash had given him, she was the only one of Dash's "P.F.F.s" that Carrot had yet too meet. As Carrot smiled and held out his hoof he was a little taken aback by her sheepish reaction to him, but he couldn't possibly be upset, as he was told she was a bit bashful, plus it was impossible for him to feel too annoyed over a minor slight by what had to be one of the most naturally stunning mares he had ever seen. In fact he had sworn he *had* seen her before, or at least somepony who looked very much like her. It fact wasn't she in all the fashion magazines not too long ago as "all the rage" as his sister would tell him as she showed him pictures from her favorite young mare monthly. "Umm.. if ye dornt min' me askin', but hae ye ever bin in magazines?" Wait, that sort of sounded like some lame pickup line! Better rephrase that dumbtail! "Er.. Ah mean jist ye look familiar! Ah jist min' mah sister an' 'er friends talk aw abit thes one model ye hae an incredible likeness tae, that's aw. Ye probably gie 'at dumb question a lot thocht." Carrot rubbed the back of mane and smiled awkwardly. What really surprised Carrot was the level that Rainbow Dash and Rarity went to with their characters. They had these incredibly well thought out, detailed summaries of a couple of the more exciting characters from right out of the books, in fact he recognized both. Although he kinda wished Dash's character was a mare instead of a stallion, but truth be told he considered playing a mare character himself, now he wish that he had, they could of had some sort of romantic connection or something in the game; sheesh, you are such a goon Carrot! Rarity had gone the extra mile though and actually dressed like her character. He had seen cosplay of the exiled sisters of Princess Veil before but not of this quality, the black body suit was spot on… and oh Luna above, so form fitting, the type that accentuated every curve on her body, he just stared in awe, it was like seeing those beautiful Wonderbolt mares in her tight body suits close up, or like in his posters posing, the type he'd love to see Dash in. Carrot clapped in delight, "Waw, that's amazin'!! actually baith yer characters ur incredible stoat!" Of course then it dawned on him how lame his own creation was. Despite Carrot's almost obsession with Daring Do, he had never actually played the RPG game before, after all who did he have to play it with before now? His R.E.A. compatriots? His sister who insisted such things were foalish and for eggheads? Yeaaaah. Until he met Dash, he didn't have anypony to share his Daring Do interest with. Carrot looked back and forth between the other two mares and their incredible descriptions. "Um ... mine ... isnae frae a book, actually. he's jist a pegasus ... wi' a nicht shift fur weaither maintenance..." He didn't wait for a reaction before continuing with what little he had, "An' he kinda jist happened tae faa intae some adventures... he's jist kinda a brawler." He placed his sheet on the table, it was all filled out with the stats and stuff, just not much when it came to description, man he was such a noob at this. Fluttershy arrived sooner rather than later, all of her shy energy directed to create this impenetrable layer of a mare given to hiding behind her mane when she met a new pony. Once she spoke to carrot some more and got to know him no doubt she would like him. He was a very friendly and kind stallion and she was a very kind mare, if shy as shy could get. It had shocked Twilight to some degree that Fluttershy had decided to play a game like this. It didn't seem up her alley as it required a great degree of interaction and a bit of aggressiveness that wasn't present with her normally. Well, maybe once she was ensconced in a fictional world with fictional characters she could release the beast of effective characterization that lay inside. Failing that, a day spent with Fluttershy was always better than a day spent without her fine touch of friendship. Twilight smiled wide as her friend made her way to her seat. Another one for the dungeon- the game dungeon she meant! "Welcome Fluttershy! I'm happy to see you could make it. We haven't started yet so you're absolutely fine. get comfortable though- we might be here a while. Truth be told I thought this was an unusual event for you to attend but I am really, really excited to see you! I made sure that the campaign won't have any wanton and unnecessary violence against any manner of woodland critter," she took a sip of water and paused, "just a lot of death traps designed with devious intent on my part," Twilight gave her words a bit of low sinister cache, her eyes suggesting a tug of violence to come before the day was done, "and this here is Carrot Fields, a local farmer. A really good stallion, really kind and sweet. You two should hit it off swimmingly," Twilight said freshly, aware all the while that Carrot was spoken for. She wondered briefly if they had reached the maximum level of physical intimacy yet. That ended when she realized that the personal lives of Rainbow Dash and Carrot Fields belonged to them both individually and as a couple. Besides, prying that deep was Luna's shtick. "Thank you, Carrot," Twilight stated as Carrot gave her the food. He wasn't known as the greatest cook in the world and this would have been the second time she would be subject to his culinary cruelty had it not been for his sister, who had a skill of some considerable note in cooking. If everything went ahead on schedule than someday she would go to a culinary school and show off her amazing skills for a wider audience! "How is your sister? I hope she is making a lot of good friends in school. I know how coming to a new town may take some time for one to adjust," Twilight said, offering up her own experiences as example. Of course she had helped save Equestria on day two of her ponyville life, but the basics were the same. Speaking of basics, Rainbow Dash was basically fangirling over her character. And it wasn't bad at all, to be honest. Strange choice of character for this sort of game but that was half the fun of pulling in as many minor character as one could and giving them a distinctive flavor and development. Rainbow had certainly done that in spades on both accounts. It could never be said that she didn't put her heart into everything she did all the time. Twilight would have to read the manifesto Rainbow had written for him that passed as backstory. Of course, the idea that the Dawn Prince was in any way linked romantically with Daring Do was pure poppycock and not something Twilight would have allowed at any fan club meetings. Everypony knew that the only pony for Daring Do was the erstwhile adventurer Bravado, and any claims otherwise were heresy. Twilight had shipped it rather hard when she was a younger mare and a filly, her only real non-research writings at the time dealing with her admittedly horrible fanfictions. They were discarded now in favor of her more serious attempts- and failings- at serious writing, but they still held a charming little place in her heart. "I love the character, Rainbow! Very intense. Like to see that energy and it looks like he'll be a valuable member of the team. I was wondering who you were going to pull out for this and I am not dissapointed, not at all. My character is one that is mentioned only in passing in one of the short stories, Trial," Twilight began as she levitated her character's mode up to the table along with her character sheet. It was a pale, almost faded yellow unicorn with a blindfold on and a reddish hue around her horn as if burned, "Drogba the Blind. Formally one of the highest court divinators, the divinator of Celestia herself. She dabbled in magics she should not have and suffered terribly. First she lost her eyesight and was forced to wear a blindfold as sunlight hurt them. Then she started to become paranoid and turned on the crown, becoming a traitor in the process! Worst of all though, she has been infected with a never-ending desire to learn more magic and gain more power. It hurts her in the most real sense every moment that she does not do this. So she is driven to find anything and everything she can. The advantage to all this is that the dark magic gave her tremendous power. She has used those not only to become a dangerous mare herself, but to brainwash a full company of henchmares! No doubt she will be an effective villain for our adventurers today, won't they?" Twiight asked with a wink, giddy with excitement. This should be a lot of fun- and speaking of fun, Rarity was having a lot of it. She tossed out her Daring Do getup and in a flash of her magic and mannerisms took on the form of Cobra Lily. A very astute selection for the fashionista if mostly because it was so far removed from who she was. The hidden key to a good roleplay was to either play yourself only amped up or play something that was completely the opposite of yourself. This was the opposite of Rarity, though Twilight could only smirk as it became apparent that she had put in a great deal of thought into her character's backstory and not just her outfit, which was just as special. It was somewhat of a shocker to see Rarity put that effort into it- wait a minute, of course it wasn't. This was Rarity. Like Dash, she never did less than her best at all times even when it came to a game. And considering Rarity was one of the msot creative mares in the land it was also no real shock that she had done a wonderful job on it. Twilight cleared her throat loudly to get everypony's attention. Her horn lit up and the various pieces of the game started floating around, snapping into place if they were physical representations of sections of the ruins or clicking together if they were small models of monsters. Cards floated and as she spoke, whether it was about models, sheets, rules, monsters, spaces, or the ruin sections themselves, they would float in the middle of the table for everypony to get a good luck. "We'll run down the basics of the game before we go into it very heavily. You are represented by your physical model. This model moves on grids- which are these square spaces on the pieces of the ruins. Your character may move the total number of spaces specified on your character sheet per turn. This number is decided by your agility, weight, and endurance stats. You may also gallop or fly at top speed at a cost of negative three to all other stats. If you do this, you roll a die and move however many spaces you roll in addition to your normal movement. Your character may only see a certain number of spaces ahead. There are five types of spaces. A normal space is just an open space. An Obvious Trap space or spaces, trap depending, can be seen. These traps will be easier for your character to prepare for. Hidden Traps appear to be open spaces until your model comes into contact with it. These traps will be harder for you to deal with, but there are fewer of them and they tend to be one and dones. An Event space means that I, as the game master, get to detail an event which takes place. This can range from an attack by cave trolls to a story advancement. The fifth is a monster space- one that you can see a certain amount of blocks away based on sight or sound. Many of the monsters have physial models and statsheets of their own. Traps do not have their own physical model- instead, each trap has a different physical course or diorama you must defeat. Whether it is a monster battle or a trap, your character's model will be transported off the board and to a sideboard with the diorama or model. Each trap, monster, and event comes with the ability for the both of us to draw cards. These cards will have an impact on the action taking place. Every character, trap, monster, and boss also have a small hand of cards only they can play. The random cards are put back into the deck- the special cards are one-use only. ...And then the room went dark. Even the light from the sun did not seem to be able to penetrate. In the complete darkness, several candles were lit and started floating towards the table as they dances in the air. Twilight's horn was the only larger source of light as the base around it started to glow red, as if it was burnt. The candles then floated to the table and burst into torches, illuminating the table warmly. The ruins had rearranged themselves so that thousands upon thousands of pieces fit onto the table and all the models were shrunk. As if to re-assure, the entire table seemed to zoom in on the group of adventurers before zooming back out. More important,y Twilight now looked like a pale shade of yellow and wore a blindfold, her sickly green mane and strands of it poking out awkwardly as around her horn the stark burnt red eased into the light menacingly. "Sooo..." Twilight leaned in dangerously, her voice thick with anticipatory menace before she smiled wide and pulled back, "like the look?! It took me a while to get the illusionary magic down right, but I think I look pretty accurate. Using the basic aural disperion from the illusions around my horn as a jumpstart for my sight magic was a unique touch I'll admit. Anyway..." she leaned in and the menace returned, "ready to adventure to your DOOM, fools?!" Fluttershy breathed a bit easier upon the reassurance from her friends that, despite being the last to arrive, she was not late. She couldn't help but smile at Twilight's obvious enthusiasm about this game... despite her own misgivings. The alicorn was correct that this game was not something she'd normally participate in. 'Roleplaying' was just a bit too close to 'performing.' The only reason she had made it through her performance at the Hearth's Warming Eve pageant and her one performance (in front of the curtain) with the Pony Tones was the support of the mares in this room. That was the main reason she'd allowed Rainbow to talk her into this. "I made sure that the campaign won't have any wanton and unnecessary violence against any manner of woodland critter,"
Fluttershy smiled gratefully at Twilight as she gave this reassurance. "Thank you, Twilight," she replied. "I would hate to play a game that..."
"just a lot of death traps designed with devious intent on my part,"
"D-d-d-death traps???" Fluttershy stuttered out, her eyes going wide. There was a glint in the alicorn's eyes that Fluttershy wasn't sure she was comfortable with... Before she could react, though, Rainbow Dash grabbed her with a wing, bringing her face-to-face with Carrot. She let out an "Eeep!" as she was drawn into the meeting. As both Rainbow and Twilight had introduced the stallion, there was no confusing who he was. "Um, its nice to meet you, Mr. Fields..." she said, in a slightly strained voice, still being held by Rainbow's wing. "Umm.. if ye dornt min' me askin', but hae ye ever bin in magazines? Er.. Ah mean jist ye look familiar! Ah jist min' mah sister an' 'er friends talk aw abit thes one model ye hae an incredible likeness tae, that's aw. Ye probably gie 'at dumb question a lot thocht." Fluttershy's face immediately flashed to pink beneath her yellow coat. She tried to back up a step, but still found herself held by Rainbow Dash. "Um... that is... I..." she struggled, trying to come up with some excuse, some way to deny what Carrot had said. But... she couldn't deny the truth, especially with her friends here. She turned away from Carrot, but said to him in a small voice, "Um... yes... I... I was a model... for a while..." It was always awkward when somepony recognized her from Photo Finish's pictures. She had never wanted to be a model, and the recognition she got from the ads made her uncomfortable. "I... I really didn't like it... I just wanted to get home to my animals..." she added, hoping to avoid talking about her brief career. Before Fluttershy's conversation with Carrot could get any more awkward, Rainbow Dash zoomed away and then started describing the character she was going to play. The others followed, with Rarity even dressing as her chosen character! "Oh, very nice, Rarity!" she said, glad for the distraction. But then, it came down to her turn. "Oh, well um..." she stammered, as she reached a wing into her saddle bag for her own character sheet. "M-my character is... Crusher. He's a diamond dog that used to work for Ahuizotl as... muscle." Fluttershy read the sheet carefully, making sure to get all of the details. "B-but after Daring Do saved him from the temple of... Palominoque, he became good!" Fluttershy's voice got more animated now, and she wasn't looking at the sheet as much. "Now, he runs an exotic flower shop! He sometimes goes into the jungles to find rare plants to sell. He's very strong, but now he only fights to help others!" Looking up. Fluttershy saw some confusion on some of the faces in the room. "Um... Rainbow Dash helped me with the first part..." she explained. Rainbow Dash couldn't help but preen under the praise for her character. "I dunno if I'd be all that much of a suave prince," she said to Rarity with a saucy smirk, "But I'm sure you'll help me out with that." She grinned happily at Carrot's compliments, at Twilight's enthusiasm. She would have been quite happy for them to keep on for a little bit longer, but she supposed they all needed their turn to be awesome, too. She boggled a little bit at Rarity's sudden costume change in the middle of the room. It had always been enough for Dash that this was Rarity's big dream, her art form. Who was she to say it was stupid, right? She didn't get it at all, but if it made Rarity happy, Dash was willing to stand around and let Rarity dress her up if need be. But at this moment, Dash couldn't have been prouder of her friend, and finally understood her passion. What an entrance! "Now THAT was awesome!" she said, just loud enough for Rarity to hear, her eyes shining brightly. Carrot's ... needed some work. But still, she had to admire that he had his own character. "Time to spread your wings, huh Carrot?" she grinned at him. Heck, she had a unicorn. Why not? Dash was a bit surprised at Fluttershy's character - not too surprised. Flowers and peace and stuff, but ... Fluttershy went with the muscle character? Dash had helped her with that one, sure, but she'd also specced out this awesome social character with, like, 37 different flaws that would have given her ridiculous bonuses to talking! Muscle, huh? Maybe Fluttershy was finally getting in touch with her inner pegasus. 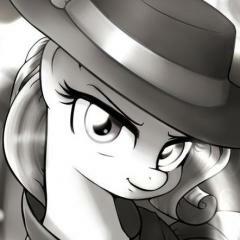 Speaking of ... she glanced around, making sure that all eyes were on Fluttershy. And Fluttershy wasn't looking. Yup, none of her friends would notice if ... she leaned over and gave a quick, fond little nuzzle at Carrot's cheek, then was right back to wandering on by, as if nothing at all had happened, totally innocent. "Nice work, Flutter! Sounds like you should have an awesome time asserting yourself!" "A race? We're having a race! SWEET!" She slid Fluttershy's rainbow smoothie under the table, trusting that her friend would come out in time. At least she'd have a treat while she hid. "I took the flaw 'Lost Love' in order to get the bonus ability 'Royal Education' and used it to get an extra spell, which I applied to a super-speed spell! It gives me a +2 versus traps and doubles my move rate, not to mention reducing my penalties for full movement to -1 instead of -3. That's combined with the flaw of 'Eternal Quest' which I used to take the bonus ability 'Racer', which reduces my full-movement penalties by 1. Though of course that by itself isn't as fast as a pegasus, but it'll help me keep up a little better! I've got a few other tricks up my horn." "Waw, that's amazin'!! actually baith yer characters ur incredible stoat!" "You seem to have her down pat, Rarity. Your opinion on the character does dovetail with mine on many aspects. You know what they say about great minds! Great work on the look, by the way,"
Rarity beamed with pride at the praise from everyone. It truly did make it all worth it to her. "Thank you all, it was a treat to design such a fun costume and I do agree that it turned out quite well," she said throwing her mane back. "I'm sure it will help me to get into character, once the game starts!" Carrot, Twilight and Fluttershy proceeded to explain the concepts for their characters. Carrot's seemed somewhat underdeveloped in comparison to the others--not that there was anything wrong with that. It was a game after all, and the important thing was that they had fun. The fact that he had chosen to create his own character rather than just picking something out of one of the books as the others had was something Rarity could actually admire. Even if he didn't have a backstory, all Rarity herself had was backstory and character already provided for her with just some added interpretation of motivations. Twilight's character, Rarity had to admit sounded quite interesting. Rarity hadn't yet gotten to many of the Daring Do short stories and had never read Trial; it was impressive that Twilight could recall minutia from the stories from it and weave from it something so detailed and intriguing as her description of Drogba's character. It proved to her that Twilight was likely more a creative mare than she gave herself credit for. Fluttershy's character was the biggest surprise though. A diamond dog? Rarity couldn't reconcile why anyone would ever want to play as one of those dim, dirty creatures. Sure, Fluttershy had her love for animals and beasts of all shapes and sizes... but diamond dogs still seemed something of a stretch. Of course, being kidnapped by the creatures and then outwitting a bunch of them with ease had a way of informing one's opinions. "Excellent! I think we all have fantastic characters," Rarity said with an enthusiastic nod. No one deserved anything but encouragement in the end she figured. "Sooo...like the look?! It took me a while to get the illusionary magic down right, but I think I look pretty accurate. Using the basic aural disperion from the illusions around my horn as a jumpstart for my sight magic was a unique touch I'll admit. Anyway... ready to adventure to your DOOM, fools?!" Twilight proceeded to explain some basics of the game and then, using her magic transformed herself into a different form through illusions. Rarity's eyes went wide with delight. She had thought she'd be the only one concerned with theatrics, but leave it to Twilight to give everything her all. She nodded as she admired the new look. "Oh my, it's just lovely, Twilight dear!" sure her, colors and blindfolded eyes were in a way terrifying, but that was just the beauty of it. It was Twilight embracing her creative heart. "Or should I say, Drogba!" she added with a giggle. Following this, Dash went on to lay out her flaws and abilities and spells. Now, Rarity was sure she understood most things in regards to the game, but this had been the source of some confusion for her at first when she read the rules, but after looking at it a few times, she thought she understood it for the most part. "Cobra Lily, being a shifty thief, has the very high agility, very low weight and middling low endurance, giving her excellent base movement speed, especially for a unicorn," Rarity explained. "Her true strength, however, is in dealing with traps. With the flaw 'Untrusting heart' I took the bonus ability 'Disarm' which allows her an opportunity to disable traps she has sprung without suffering the consequences of them." She nodded and then continued. "Additionally, with the flaw 'Bitter Grudge', I have given her a "First Strike' ability, reflecting her ability to get a drop on enemies, which lets her act first when she battles a monster. Cobra has very few spells for a unicorn character, but her speed and versatility make up for it." With Fluttershy obviously so self-conscious in her admission, Carrot Fields felt a little bad about asking her about her modeling career, though he was curious what could have made such a celebrity disappear as suddenly as she had captured Equestria’s attention. It was a shame that she felt so poorly about the whole affair - she definitely had all the natural makings of a supermodel, but it was best he didn't follow up on that thought. What did pique his curiosity was what she said at the end about her animals. "Ye a vwt? Ur an beastie caretaker? If sae, eh'd loove some advice oan hoo tae keep those pesky rabbits frae regularly raidin' mah fields ay carrots! Bludy lang eared pests ur always causin' mischief an' aw, an' eh'd loove tae fin' a way tae keep them our but eh'd raither nae hurt them if Ah can help it, jist stop them frae takin' sae much ay mah produce!" His face flushed fiercely as Dash took advantage of her friends’ distraction to show that small affection – she was always so fierce and tough that these little displays were all the more adorable; he gave a big, bashful grin – and then, before she could pull away, he ducked his head forward to return that nuzzle with a lil’ kiss right on her lil’ nose. No words were needed. Before Carrot could get an answer, Twilight suddenly added atmosphere to the room, well “atmosphere” was certainly an understatement. It was actually incredible, as if they were actually inside a Daring Do book, the alicorn even gave herself the sickly appearance of their evil foe, the malevolent magic user, Drogba the Blind! The ruddy maned stallion clapped his forehooves like a giddy schoolcolt, complete with a huge, whimsical smile. Sure it was a little foalish, but who cares, adults were allowed to have fun and games too! Hah, talk about a hit! Rainbow Dash and Rarity both seem impressed by her display and Carrot was having a jolly good time as well with it, though whether it was because of her work or because he was close enough to rainbow Dash for the two to probably play hoofsies under the table. In fact, Twilight had a brief blush of embarrassment when she saw Rainbow's hoof travel under the table as she could only imagine what her friend was doing, but the realization that Fluttershy was under there soothed her momentarily restless imagination. Poor Fluttershy. Had Twilight gone overboard a little? Definitely. That was the intent, afterall. But hopefully once the game went on she would be okay. After all, her character sounded fun. In fact, all of their character sheets were pretty good. They had really gotten into the trait system inherent in the game design, but Twilight had prepared. She couldn't reveal her sheet just yet, not until after the game, but Drogba was a titanic powerhouse in illusionary and preparation magic. The heroes would have their hooves full with not only trying to get to her to stop her, but also simply stopping her once they got there. It was bound to be a lot of fun...for Drogba, at least! But now it was time to get the game rolling. They didn't want to daddle and dilly too much on the preliminary discussion, especially since every moment wasted was a moment closer to final victory for Drogba the Blind. Twilight smiled at her friends as they finished talking about their characters, a small shroud descending above the majority of the game area, blinding them to all but their characters, their friends, and the spaces in front of their character. In front of the group of characters was a clear badland path that ends in three different entrances into the heart of the ruins. One is a cave entrance that heads below, the other is straight ahead under a stone pillar, and still a third is a vertical staircase heading atop a large hill that ends in a small wooden door. OOC- Whoever is the fastest can go first,m but it really doesn't matter. Rainbow Dash ooooed softly as Rarity detailed her character's specialties. "I have the First Strike ability, too! Gave up my ability to cast light spells for it. Which is bad for temple delving, I know, but I took the Batwing Vision spell to make up for it. I also have the Jitterbean trait, which gives me a +1 to initiative and reflex saves as long as I've had a cup of coffee that day! Course, I also get a -1 to skill checks if I haven't... but Untrusting Heart? Really? Well, Dawn Prince will have to see if he can help you to trust again!" She had just peered over Carrot's sheet after nuzzling him when she felt that little peck to her nose. Her cheeks flushed crimson and she quickly picked up Carrot's sheet to hold in front of her face briefly, hiding the goofy lil' grin on her face. "Ah-heh. Hrm. Let me see. Um. Heh. Kinda basic. You didn't even take any bonus abilities! Just gotta take a few flaws to make up for it. Like, um... here, you can take the 'Easily Bored' flaw to get the 'Heroic Stature' bonus, for +2 brawn and nimbleness. And you can take a -4 to concentration checks when ponies are talking in order to bump up your flight skill by +4. Drop your wiseness and you can bump up your brawn and nimbleness even more. You can take 'Street Smarts' trait to drop your knowledge skills by 2 universally, but give you a +4 to urban survival. And that's even *before* we move into the fast movement special abilities... " She started marking up Carrot's sheet with flaws and bonus abilities, shifting the points around a bit to make sure he was really, really fast and awesome! And dropping most of the egghead stuff from his sheet all the same. But then it was time to play, and the dimming lights and focus on the field made Rainbow Dash just quiver with excitement. She wriggled in her seat and budged in closer, grabbing up her dice. "I'll show you a foal! All right, I'll use my initiative boosts ..." She rolled her dice. "And unless anyone can beat that..." She reached out to move Dawn Prince down the field, bringing him to the arch. "OK, since this is the easiest route to see the straight path, I'm going to use my 'Boldly Forward' ability to race under the pillar, giving me a +4 bonus to my saves against traps as long as I'm moving at a run..."
"Nonono, even better ... "
Dawn Prince, most awesome Scion of the Lost Kingdom, tossed his perfect sky-blue mane as he looked around at the picturesque ruins set into the forested hills. "Ah, what a beautiful day to find some treasure." He took a deep breath of the fresh air, then grinned back at his companions. "See those tracks? Looks like we're not alone. Drogba's already made it here. Looks like it's a bit of a race." He nodded at the pegasus. "Hey, uh ... "
"Hey, Carrot, what's your guy's name?" "Why don't you go ahead and fly up along that rocky route up there, see if you can see any signs of Drogba's minions setting off traps up that way. Cobra Lily, you light up that cave entrance with a light spell so that Crusher can examine the stonework down there for anything suspicious. meanwhile, I'll test that pillar area for traps." He gave a confident grin, and his horn glowed with the red-orange hope of a new dawn, tinting his blue mane and white coat as he cast a swiftness spell over himself, then turned and streaked down under the pillar, testing for traps in the most awesome of 'headfirst' ways, trailing an afterimage streak of white and orange behind. Carrot Field’s had something on his face one didn’t see often with him, a sly grin; he had caught Dash off guard with an affectionate jester of his own and her reaction was adorably cute. He was astute enough not to push it though and possibly embarrass her in front of her BFFs, content to watch Dash blush behind the paper, attempting to play it cool, which only made the situation more adorable. The answer was apparently no as Dash reworked his sheet with more vigor that any school teacher wither red pen, altering Carrot’s character in ways that he didn’t even think about. Although he didn't entirely understanding her explanations, he deferred, figuring she must know what she is doing right? Still he did worry some, “er, doesn’t thes make heem a dumb blockheid sort?” Sure he wanted the character to be really tough, but you can be tough and also be intellectual! Right? Well maybe not in this game, which he felt was disappointing. Before he could further address his concerns about his character being the oblivious sort, Dash started right up with the actual game with appropriately dramatic flair. As she adorkably announced her character’s moves, she asked Carrot's character's name, which brought up the realization he forgot to even write that and the character's physical description down! Carrot facehoofed, ugh, what a dumbail thing to forget… At least he had the name and description memorized! “Oh! he’s Rain Runner! he’s lecht periwinkle blue wi' a midnecht blue mane 'at has yella', lightenin' loch streaks in it!” Now that he said it out loud, that did sound a bit foalish. "Anyway, uh, he discovered his special talent when he was a foal. His parents waur weaither ponies who sent heem out aheid while they slowed doon an unplanned st'rm, tae warn th' fairmers in th' area 'at it was comin', thus got his cutie mark ay a thunderheid wi' a lightnin' bolt an' raindraps!" It really didn’t sound like somepony who would be on a Daring Do style adventure like the others, but good stories often had that everypony character that the readers could identify with, and carrot felt he could do so with Rain Runner, and that was the point, wasn't it? Speak of which, time to get into character! “Uh, Rain Runner salutes ‘aye, aye O' morn Prince!’ an' flies alang th' rocks abune tae check fur any minions. Ah guess since he has 'at extra +4 flecht skill an' +2 nimbleness, he is able tae cowre th' area pretty quickly an' umm, diz th' +4 urban survival help wi' onie traps?" "I have the First Strike ability, too! Gave up my ability to cast light spells for it. Which is bad for temple delving, I know, but I took the Batwing Vision spell to make up for it. I also have the Jitterbean trait, which gives me a +1 to initiative and reflex saves as long as I've had a cup of coffee that day! Course, I also get a -1 to skill checks if I haven't... but Untrusting Heart? Really? Well, Dawn Prince will have to see if he can help you to trust again!" "Oh, I'd be very interested to see him try. I'll assure you, Cobra Lily is not an easy nut to crack," Rarity giggled happily. It was kind of surprising to her to realize how much fun this was... and they had only just started. She smiled as Rainbow went on to explain things to and help Carrot. Her enthusiasm was delightful, and her knowledge of the game was certainly impressive. Rarity had figured out how to build her character, but only after taking lots of time to study the game rules and figure out how it all worked. For detail oriented ponies like Twilight and Rarity herself, it was easy enough to figure these things out. For Rainbow, however, it was often hard to learn complicated things unless she could do it somehow while flying. She supposed it was all in the power that Miss Daring Do had over Rainbow. This was after all, very detail oriented stuff, dealing with logic and mathematics. Rainbow's fan fervor, she supposed had let her tap into the patience she might have otherwise lacked long enough to figure it all out. Now she was even able to explain it all to others.For a pony who was known to underestimate her own intelligence far too regularly, it was a delight to see. Dash had her turn and then Carrot. When it was finally Rarity's turn she rolled the die and moved ahead. Cobra Lily, the viperous vixen of the verdant vale, rolled her eyes and gave an immodest scoff as she slunk in front of the prince. "I may have indulged you in agreeing to join you against that cursed Drogba, your most esteemed highness," Lily said with a sneer, blatantly mocking the princely appellation. "But you have a lot of nerve if you believe that it is your place to order the master thief Cobra Lily around. Out here, far from the safety of castle walls, royal blood is meaningless." Despite her words, Lily couldn't deny that given their abilities, the prince's plan did seem sound. She might have argued it on principle if she was in a slightly different mood, but the threat posed by Drogba being what it was... and the treasures said to be in the area being what they were... she was willing to swallow some of her pride at least and try to play nice. She wasn't about to just give some haughty prince the pleasure of thinking it would be easy to command her though. Cobra Lily was an independent spirit. She did as she pleased. She was the last mare to swoon over some fool prince, even if he was admittedly not bad to look at. It was only fools who let themselves trust others blindly. She gave a low sigh and flipped her luxurious mane out behind her. "Sending me off toward some dark, foreboding cave; honestly, it's almost as if our dear prince wants to be rid of me," she said while looking toward Crusher. "But I suppose I'll play along for now," she said through a sigh. "You there, dog. Come along. Let's do as his illustrious highness commands." Fluttershy took several deep breaths, trying to slow her racing heartbeat. She used a breathing technique that Twilight had shown her, and was soon calm enough to peek out from under the table. She winced, seeing Twilight still under her illusion spell, M-maybe she should stay under the table for a bit long... ooh, a smoothie! She hadn't noticed Rainbow's hoof deliver the beverage, but she was appreciative. Looking Carrot and Rainbow, Fluttershy was suddenly reminded that the stallion had asked her something before her uncermoniuous dive under the table. She leaned over to Rainbow's coltfriend (she hoped...) and said, "Um, you mentioned you were having trouble with rabbits in your fields? I'm sorry about that... I've tried to get the local bunnies to limit their feeding from ponies' fields, but they can be so subborn... And carrots are some of their favorites." Thinking, she added, "I can try to speak to the warren near your farm, if that's ok..."
Crusher looked down at the poines that made up the majority of the party. The two unicorns both seemed to think they should be in charge. Crusher didn't really care who was in charge, nor did he really care about treasure... too much. But if the two were going to clash like this, it could cause problems. In an attempt to diffuse the potential confrontation, he spoke up. "Um, that is... I... ah hem! Prince pony makes sense. I will go with the Lady Thief." Before moving out though, the diamond dog crouched down to Cobra Lily and said, in a no-nonsense tone, "I am not just a 'dog' Lady Thief. My name is Crusher. I would appreciate it if you give me the same respect I would give you." Straightening, Crusher let a fanged smile cross his face. "Now, shall we go?" he asked. Fluttershy took a deep breath after delivering her lines, and asked nervously, "Um, was that OK?" “That was good, Fluttershy,” Twilight said softly, immediately looking back to the board and cackling in-character to herself. It was nice to see Fluttershy come out of her shell a little! Back to the board did Twilight's eyes go. The Arch was a relatively simple encounter space, which made it an exciting place to be so early in the game. There was such a wide variety of things that could happen there that it made anypony invested in the game excited. It could be a friendly NPC handing out items or clues, an event such as a natural disaster or some geographical anomaly coming into play, or most likely a monster of some kind trying to gobble up the adventurers. Rainbow Dash moved past the arch and Twilight's horn glowed a dark ominous purple and levitated a group of cards out for all to see. “The arch is an encounter site. An encounter site could have any number of things happen, ranging from nothing at all to cataclysmic disasters. I pick a card and keep it until everyone has finished their turn, and then reveal it. We then take whatever action the card asks for us to do, taking into account our abilities and stats,” She began before drawing her card and...smiling a sinister little smile. Drogba the Blind snarled in equal parts annoyance and agony, the walls of the ruin closing in it seemed with every second of her failed search. Oh by the dark magic of the Rhulic Tomes and by the Great Horned Stars, why does it persist in evading her? Knowledge escaped her grasp every second of the day. The more she failed the more agonizing the need became and with every success the more addicting it was. The cycle was brutal and wonderful, endless and immediate, tormenting and divine. This ruin held the key to solving the greater whole of the issue of knowledge drain, though. With this ruin's secrets in her possession she could overthrow the whole corrupt monarchy and access the most secret and guarded of magics. Let that happen and by the cracking earth of eternity's woeful gaze she would rule all that was, is, and would be...but even then, the wimpering-mad part of her that still knew what she had gotten into knew that even if she knew everything she would be cursed to want more. She'd have to worry about that later. Her horn cast a dark rainbow glow that sent out a small collection of silently screaming hands to touch her surroundings, instantly informing her of everything that was around her. Book after book was touched and burned to ash- THEY HELD NOTHING TO HER. Suddenly, she felt a sensation, that of a breeze against a wire thicket. She growled. Something had triggered her warning near the front entrance to the ruins. Whatever it was would come to regret spelunking in Drogba's Domain. Her horn spat out an angry red burst which quickly lost all color as it shot out beyond the speed of sight up through the ruins and towards the entrance, where it eventually found the target. A construct above the arch suddenly came to live, shaking itself from its stone core. It looked like a orangutang-komodo dragon hybrid with a useful tail and a baleful stone gaze. It latched onto the arch and then hung itself upside down, staring down the group from behind and letting out a screech! ...Drogba's Stare, a type of basilisk construct! “You have encountered one of Drogba's lethal constructs, the Stare! It is a basilisk type with an orangutang-komodo base. Magically powered and gifted, it has average combat stats across the board. However, it has two abilities that will concern you. Every living creature it looks at, eyes or not, must pass a Will test. If they fail, the target's stats are cut in half across the board. Fail a second time, and you are turned to stone for six turns. Each turn you must take an unaided Will test. Fail twice, and when you are out you suffer -1 to all abilities and stats. Fail three times, and you suffer -3 to all abilities and stats. Fail four times and your character is stone permanently, unless he or she accepts mind-wiping to become a Minion of Drogba,” Twilight cackled. It was a devious little pet, wasn't it? “The thing to note is that this is a passive ability in his field of view, so he can't use it outside of his field of view BUT it is active at all times, whether he is attacking or defending or nothing at all. He hits every target in his field of view every time they are in it, enter it, or leave it. He also has high health. No matter what though, he is not a living creature- magical construct of stone with a good defense rating and high health. Carrot's ability allows it to negate the construct advantage of “Magical Programming”, which would otherwise have given it the ability to attack first. With everything on an open field and even ground in terms of abilities, First Strikers may go first. Dash, I know you know how to play- why don't you go first and show us all what a real 'hero' looks like?” Twilight smiled, allowing Drogba's failing teeth to shine through. In between everypony stating what their characters were doing, Rainbow Dash had to reassure Carrot a bit. "Not a blockhead, see? Charismatic and still has smarts - but the skill sets are focused towards street smarts instead of booklearning. So he knows how to get things done, he just doesn't know the big fancy words for it. But here, I didn't realize he had a weather specialty... quick, we'll swap out this for this... this for this... now instead of flat-up extra speed, he's got twice as much extra speed if he's in strong weather, by catching the winds... and here, instead of his +4 to flight, he's got a +2 to flight and a +4 to weather handling. Shoulda thought of that in the first place. He's not quite as fast under normal circumstances, but as he levels up, he'll be unstoppable in rough weather. An' yeah, urban survival helps with traps if they're in constructed areas - that's why I sent you up to the tower instead of towards the cave. But stuff like-"
Even though she wasn't flying, though, if Dash was excited enough, she could track several things at once. So even as she was talking with Carrot, Rarity was having Cobra Lily retort towards Dawn Prince. She suddenly turned away from Carrot and gave her best roguish, dashing grin to Rarity, tossing her mane, and gave a her friend a wink. "I haven't seen the inside of my palace in years, Sweetheart. Don't forget we're in a race - no time to discuss this in committee!" Then she went right back to murmuring to Carrot. "But stuff like deadfalls and junk in the forest, you can't get a bonus against from that." Her quick little aside to Carrot finished, she listened to Fluttershy, then grinned happily at her friend. "Perfect, Fluttershy! You got those diamond dog accents down perfect! Way to stand up for yourself!" She grinned at Twilight's of-course-perfect depiction of Drogba, wriggling in her chair impatiently as she waited for her turn, and to find out what they found in the three separate locations... but turns out they didn't have a chance to really do any searching! There was a fight already! "AWEsome! Time to do this!" Dawn Prince spun around at the crashing sound of the statuary hitting the ground behind them, his blue mane floating around him for a moment as he let out a soft 'ha'. "Pulling out your trump cards this early, Drogba? You must really be frantic today..." He raised his voice and called out, "Everypony, spread out around him so he can't look at two of us at the same time! Flank him and move in!" His enhanced speed brought him to the front of the huge statue, trying to get its attention so it would have to focus on him before any of his comrades. "Hey, stonehead!" he cried, confident in his athletic ability to dodge any and all assaults by so monstrous and slow a creature, "Tell Drogba she'll need to send more than gravel with delusions of grandeur to beat us!" His horn glowed with that orange magic as he readied himself for the beast's next action, and the dew lifted itself from the damp grass, floating in front of him to form a vanity mirror - and then he gritted his teeth and his horn flared with orange magic, and the mirror expanded to hide the prince, so that the statue could see only itself. Dash looked over at Twilight. "All of Dawn Prince's magical powers are based off of the morning dew and the morning's light. Like his speed is from racing the crest of the dawn's light in the morning as it spreads across the land. This is a Dew Mirror, which is a reflective mirror made of mist floating in the air. It's technically a level 0 spell - it's supposed help him fix his mane in the morning, and is part of the basic royalty magic set, but I'm going to Exert so I can expand its size so that it works as a shield, and the basilisk will be staring at itself. I'll have to roll or be fatigued, but it's only a level 0 so I'll only be fatigued if I roll a 1 or a 2. Here's hoping it works to turn it back to stone!" She muttered softly, "Never thought I'd get a use out of that useless spell..."
Rarity smiled at Fluttershy after she took her turn. "That was exquisite, darling," she assured the meek mare. "Believe me, as one who spent enough time among those awful dogs as any one pony deserves to, you voiced your role with the right cadence and intensity!" Cobra Lily clicked her tongue in annoyance as her eyes narrowed upon the large dog, showing no signs of intimidation nor respect. "I'll give you some credit. You have a far greater ability to string together words to form sentences than I'd have imagined from a dog, but I don't think you know who you're dealing with. You want the respect of the master thief Cobra Lily, you have to earn it first." Lily gave an indifferent shrug and then just continued ahead, not wasting more words. Rarity smiled at the smart retort Dash had her character give. This was surprisingly fun. Spirited Cobra Lily wasn't going to just take Dawn Prince's cavalier response, however. "I am not a committee!" Cobra Lily shouted bitterly. She shook her head and then threw back her mane. "I'm not sure you quite yet appreciate just who it is your dealing with here. No thief this side of the Reintight sea has my reputation. I've been making valuable treasures mine since before I had my cutie mark." She offered up a proud smile. "So, just because you've got a cute face and are used to getting your way, don't think that gives you the right to order me around as you please." Then it was Twilight's turn and Drogba acted. It was kind of hard for Rarity to picture the monster. Basilisks, from what Rarity knew of deadly creatures, were snake monsters, somewhat related to the cockatrices you could find in the Everfree Forest and with similar powers. The orangutan-dragon hybrid Twilight described didn't sound like Rarity's picture of one, though she could assume Twilight was doing her best to spice it up with some creativity. Not knowing the practical pony to have much creativity in her, Rarity could appreciate this. "Interesting," Rarity said as Twilight described the beast's ability. "Well, Lily certainly isn't the sort to fear any test of will. She fights mainly with her knives though... so, I'm not sure how well she'll be able to damage something made of rock..."
She wasn't so sure what to do, but then Dash, the other player with first strike on their character, decided to take the first action. Rarity smiled at the clever strategy of turning the basilisk's ability against itself. "Excellent thought, Rainbow dear. If it is forced to take its own will test and fails, we can lower its defense! Then Lily's attacks will be able to slice through!" she said, nodding. Excited, she started to respond in character. Cobra Lily's eyes widened as the irritation she had building for her companions was sliced in two by the sudden appearance of a terrible monster. Drogba, it seemed, knew they were there. "And here we have the problem with working in groups. Never can you get very far without being noticed..." she said, as she instinctively removed four knives from her cloak with magic, floating them in front of her face. She gave a mild scoff as Dawn Princes barked another order to them, but did not say anything this time. With a threat having surfaced, this wasn't the time for squabbling. She dashed around and then rolled to the ground until she was on the right side of the creature from where Dawn Prince stood. She then studied the adversary. He seemed to be of a decidedly stony and solid constitution.Lily clicked her tongue at this, not imagining her knives, as sharp as they were and as good she was at wielding them would be of much use on the beast. She glanced back over at Dawn Prince then, just in time to see him magically summon a big silly mirror. "Cute dress-up mirror, sweetheart," she said mockingly, even as she recognized what he likely had planned was a good call. She had doubts that the basilisk would turn itself to stone, but a simple glance could still weaken it composure greatly, in which case its defense might be penetrate. "Cobra Lily attacks," Rarity said, nodding. "Which I believe means I roll a die as well," she said before deciding to do just that. It was fascinating how the personalities of the ponies around him changed as they played their characters. To hear Rarity making fun of someone for having a mirror, or Fluttershy deepening her voice to be the powerful diamond dog, it was a little surreal and very fun, to see ponies getting out of their normal mode to try something new. He knew he was going to have a lot of fun being able to play a pegasus! Carrot had considered making his character a mare, just because he had based Rain Runner off of Dash. However, he had worried that would be too weird, playing a mare, so he hadn’t. Then Dash and Fluttershy had both played guys, and he wished once more that Rain Runner was a mare so she could flirt with Dawn Prince. But he couldn’t really complain, watching Rarity and Dash pseudo-flirt – Rarity wearing that really, really nice outfit. It was awfully appealing, but he tried not to stare too much, and just focused down on his character sheet, his cheeks a bit flushed still. Fluttershy blushed a little as the girls complemented her role playing. Though she'd been under the effects of poison joke, her time singing with the Ponytones as a bass had improved her ability to speak in a much lower tone than her usual voice. She didn't think she was quite as good as the other girls at getting into character, she was looking forward to it. She listened to Twilight's explanation of the monster with confusion on her face. Oh, she understood that it was a a rock monster with a petrifying gaze like a cockatrice. It was the rest of the explanation that left her wondering. "Um, Twilight, I don't think its possible to get a hybrid between and orangutang and a komodo lizard..." she said in a quiet voice, "I mean, they are in the same phylum, but not the same class..." Then however, she was swept back into the action of the game. Crusher barely reacted when the stone construct landed amongst them. He simply turned and sized up the creature, then cracked his huge knuckles. Though he did not fight much anymore, when he was working for Ahuizotl, he had had to be prepared for anything at a moment's notice. Crusher had punched more strange creatures than he could count. Crusher and his player smiled at the interplay between the Prince and Cobra Lily. It was almost as if Rarity and Rainbow had swapped places. Dawn Prince was elegant and refined, Lily was cocky and sharp witted. Though, Fluttershy didn't think Rainbow could be quite so... flirty as Rarity was playing. Carrot still seemed to be having some trouble finding his character's 'voice.' Rainbow, though, was trying to help him out. Fluttershy smiled at the interaction between the two. She could help but think how cute the two of them looked together, but she could never say anything like that out loud, especially to Rainbow Dash. Fluttershy knew better than most what lay behind Rainbow's bravado, and the last thing Fluttershy wanted to do was embarrass her. Meanwhile, Cobra Lily had pulled out her knives and was preparing to attack. Dawn Prince had charged to the front of the beast, erecting a mirror of some sort. Rain Runner had ascended to a cloud, and it appeared as though the pegasus was going to try to hit the creature with lightning. Crusher, seeing all the ponies simply preparing themselves. stepped right up to the constructs flank, and hit it with a right cross! Twilight laughed gently as Fluttershy noted her concerns for the origin of the monster. A magical construct need not follow the laws of any biological order or genus, family or species. Imagination, tools, and resources were all that were required and Drogba certainly had all three in spades no matter her sadistic abilities. “It isn't a biological creature, Fluttershy. It's a magical construct. It does not live, blink, eat, drink, or rest. Drogba could have created a creature of any make or model as a result but...well, I had extra bases for those creatures so that's what I used!” Twilight smiled so wide a squee could be heard audibly. She wasn't the hoofiest of mares so getting this together was a challenge she relished and was more than happy to pass off as a success. After that she allowed the group to state their actions without interruption. Some good choices, some odd choices, but overall they were [laying to their characters well. Twilight marked a number on her sheet and then thought about the actions. Rain Runner followed by the Dawn Prince, Cobra Lilly, and Crusher. Twilight studied the area a little and nodded to herself, rolling her dice in secret. She nodded. “Okay, Rain Runner- you are in the field of view of the Stare as you fly up. Please take your Will Test. If you pass, you may continue on with your plan, rolling then for Agility, aided, and for your Action, aided. If you fail, you can bring the cloud down with a successful Action check but you can't do anymore. Dawn- sadly, the Stare is not a living creature and thus not subject to its own passive ability. Could you roll for the Dew Mirror's Magical Resistance or Reflective Capacity? Cobra, roll for your Will test. If you pass, roll for your attack as normal with a plus one since the Stare's attention is divided.. If you fail, roll for your attack with stats halved. Crusher- you avoided the passive ability by the smallest of margins. You are granted plus two to your attack roll this round. Please roll your dice,” Twilight finished judiciously. Rainbow Dash sagged. "Awww, but it was such an awesome plan! I was supposed to take the stare! My saves are awesome!" she protested. Then blinked. "Magical ... Reflective ... what?" She pulled out her main book and started flipping through it. "Oh, right ... ummm ... " She had never had to roll before, and despite having wrangled for every last point she could to make her character awesome, she was suddenly at a loss as to exactly how to go about rolling. "Right, so ... adding ... and this .... " She stuck her tongue out the side of her mouth as she tried to add it up in her head, then sighed and got out a piece of scratch paper and a pencil, and started making little notes down the side. (mumblemumblemumble) She spat out the pencil as she finished, scooped up a few dice with one hoof, and gave them a roll. "37," she finally declared, "aaand ... 34. Waste of some good rolls ... stupid mirror." She glanced up at Fluttershy. "Hey, when you take this statue to pieces, try to keep the head in one piece, OK? I've got an idea... "